In earlier blog posts we presented two articles that discussed new directions for preventing free radical damage and natural phytochemical Nrf2 activators for chemoprevention. We told you that HPDI was working on a new formula called Ultimate Protector™ that incorporates the ideas contained in these articles. The product will soon be available (mid-November), so we are taking this opportunity to provide you with the details of our design logic and product ingredients. Ultimate Protector™ is a unique cell protection formula that simultaneously meets the needs for high levels of non-GMO Vitamin C, full spectrum antioxidants (high ORAC values), and protective enzyme activators (Nrf2 activators) in a single product. This potent combination of characteristics distinguishes the formula because no other single product available today offers such complete protection. This is the single best formula for preventing free radical damage that is available. Ultimate Protector™ contains USP-grade non-GMO Buffered Vitamin C from Cassava (tapioca), AnthoComplete™ (high-ORAC powder: 3000 units/g from Wild Blueberry, Wild Bilberry, Acai, Black Currant Extract, Sweet Cherry, Raspberry, Elderberry, Blackberry, Aronia, Black Soybean Hull Extract, and Blue Corn), CoffeeBerry® Forte (high-ORAC powder: 6,000 units/g from Coffee Berry), Curcumin (standardized extract with 95% curcuminoids), Trans-Resveratrol (98% from Giant Knotweed), VitaBerry® Plus (high-ORAC powder: 12,000 units/g from freeze-dried Grape Seed, Wild Blueberry, Wild Bilberry, Cranberry, Tart Cherry, Prune, Raspberry Seed, Strawberry, Trans-Resveratrol, and Quercetin), VitaVeggie® (high-ORAC powder: 6,000 units/g from Broccoli, Broccoli Sprouts, Tomato, Kale, Carrot, Brussels Sprouts, Onion, and Spinach), and Bioperine® (a patented black pepper extract that enhances absorption of all ingredients). Ultimate Protector™ is contained in a capsule suitable for vegetarians (i.e., a veggie cap) and contains no magnesium stearate. 1) The need for a non-GMO Vitamin C product. That is, a Vitamin C fomula that avoids genetically modified sources such as corn, potatoes, or beets. 2) The need for a single, powerful antioxidant formula for preventing free radical damage. That is, a single, easy-to-take antioxidant formula offering a broad range of extremely high-ORAC plant source antioxidants. These antioxidants should protect against the full range of free radicals found in the human body including: superoxide anion (O2·-), peroxyl radicals (ROO·), hydroxyl radicals (HO·), singlet oxygen (1O2), and peroxynitrite (ONOO-). 3) The need for a supplement providing a full spectrum of Nrf2 activators. 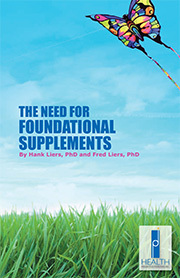 That is, a supplement providing a wide range of natural Nrf2 transcription factor activators that allow the body to make its own antioxidant enzymes (e.g., superoxide dismutase (SOD), catalase, and glutathione peroxidase). Scientific research has shown that these are found in a wide range of fruits, vegetable, and herbs and that products that provide a wide range of Nrf2 activators give significantly higher levels of the endogenously produced antioxidant enzymes. High-quality, USP grade Vitamin C has been obtained historically from corn, potatoes, and/or beets. Unfortunately, all of these sources have to a large extent gone to genetically modified (GMO) variants. While some non-GMO sources of ascorbic acid made from these plants still are available, it is nevertheless becoming increasingly difficult to ascertain whether a source is non-GMO. Recently, a new source of high-purity (>99%) USP-grade ascorbic acid has become available from cassava (tapioca). Our manufacturer uses this non-GMO material to make both calcium and magnesium ascorbates using a “water method” process. This method produces a Vitamin C product that is absorbed and retained in the body far better than Vitamin C produced by the traditional methods. In nature, Vitamin C is found generally in plant sources containing polyphenols. Vitamin C and polyphenols work together to provide a high level of antioxidant protection and they support the function of each other in the process. For example, Vitamin C is needed by the body to produce collagen and certain polyphenols (especially oligomeric proanthocyanidins) (OPCs) crosslink the collagen and make it stronger. Free radicals are reactive species that can have adverse effects on normal physiological functions. Studies associate the five major types of free radicals (i.e., hydroxyl, peroxyl, peroxynitrite, singlet oxygen, and superoxide anion) with health conditions such as cardiovascular disease, hypertension, breakdown of vital proteins, chronic inflammation, Alzheimer’s disease, and certain cancers. Preventing free radical damage is the goal. Antioxidants function as a vital line of defense against free radicals by blocking their attack on DNA, vital proteins, lipids, and amino acids. Until now, efforts to identify the effect of antioxidants on all five types of free radicals were constrained by limited testing procedures. Historically,the ORAC assay, the industry-standard test, could measure only antioxidant activity of one of the five types of free radicals, i.e., the peroxyl radical. Based upon traditional ORAC testing methodology, six capsules of Ultimate Protector™ will provide a net ORAC value of greater than 5,000 units. Recent technological developments have resulted in a comprehensive new testing method called the Total ORAC5.0™ assay. Because of the development of the Total ORAC5.0™ test, it is now possible to target and measure the effects of antioxidants on the five major types of free radicals found in the body. We are currently in the process of testing Ultimate Protector™ using this new ORAC5.0™ assay. We are confident that our formula offers protection against these five major types of free-radicals because we combine a wide range of extremely high-ORAC fruit, vegetable, and herbal blends. As soon as the results are available (in early November), we will update this article with the findings. In order to survive under a variety of environmental or intracellular stresses, our cells have developed highly efficient protective mechanisms to protect themselves from oxidative or electrophilic challenges. Proteins that comprise phase II detoxification and antioxidant enzymes provide an enzymatic line of defense against reactive oxygen species (ROS). These enzymes include superoxide dismutase (SOD), catalase, glutathione peroxidase, glutathione S-transferase (GST), and glutamate cysteine ligase. Induction of phase II and antioxidant enzymes are regulated at the DNA/gene level by an antioxidant responsive element (ARE). ARE-mediated gene expression plays a central role in the cellular defense against cellular oxidative damage. Experimental evidence supports the view that induction of ARE-mediated cytoprotective enzymes is a critical and sufficient mechanism to enable protection against disease provoked by environmental and endogenous insults. One of the key ARE-binding transcription factors is Nrf2. Induction of cytoprotective enzymes in response to ROS, electrophiles, and phytochemicals is a cellular event that is highly dependent on Nrf2 protein. By activating Nrf2 signaling, phytochemicals can increase cellular detoxification and antioxidant enzymes, thereby enhancing removal of ROS and toxic chemicals and preventing disease. This hypothesis has been tested in many studies. For example, a study with sulforaphane (an isothiocyanate present abundantly in cruciferous vegetables) shows that oral administration of this phytochemical can effectively block benzo[a]pyrene-induced forestomach tumors in mice. This protective effect was abrogated in mice that could not produce Nrf2. This supports the critical role of phase II detoxification and antioxidant enzymes in the prevention of carcinogenesis by chemopreventive agents. Nrf2 is normally bound in the cytoplasm of cells to a protein called KEAP1. However, when an appropriate photochemical agent attaches to a kinase receptor on the cell wall a phosphate group is released that causes the Nrf2 to be released. The Nrf2 then migrates into the cell nucleus and causes an antioxidant enzyme (e.g., superoxide dismutase (SOD)) to be fabricated and released. This endogenously produced enzyme then can protect against ROS, electrophiles, and other toxic agents. In practical experience, it has been found that a combination of multiple polyphenols works significantly better than single ingredients. In fact, in one experiment it was found that a combination of five ingredients all known to be Nrf2 activators was 18 times more effective than any single ingredient. Furthermore, it was found that this combination of five ingredients was able to increase levels of SOD by 30% and catalase by 56% after 120 days of taking the combination. 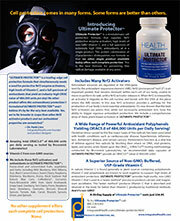 In view of the considerations above, we include a wide range of Nrf2 activators in Ultimate Protector™. These include a large variety of freeze-dried and concentrated fruits, vegetables, and herbs. These include Wild Blueberry, Wild Bilberry, Acai, Black Currant Extract, Sweet Cherry, Raspberry, Elderberry, Blackberry, Aronia, Black Soybean Hull Extract, Blue Corn, CoffeeBerry®, Curcumin (standardized extract with 95% curcuminoids from Turmeric), Glutathione (reduced), Trans-Resveratrol (98% from Giant Knotweed), Grape Seed, Cranberry, Tart Cherry, Prune, Raspberry Seed, Strawberry, Quercetin, Broccoli, Broccoli Sprouts, Tomato, Kale, Carrot, Brussels Sprouts, Onion, and Spinach. Ultimate Protector™ includes the following phytonutrients in its array of freeze-dried and concentrated fruits, vegetables, and herbs: Anthocyandins, Beta Carotene, Caffeic acid, Chlorogenic acid, Ellagic acid, Ferulic acid, Glucosinolates, Lutein, Lycopene, Phenolic acids, Polyphenols, Polysaccharides Proanthocyanidins, Ptero-Stilbene, Quercetin, Quinic acid, Sulforaphane, and Trans-Resveratrol. AnthoComplete™ is a nutritious, non-GMO blend that provides a broad spectrum of anthocyanins derived from wild bilberry, wild blueberry, acai, black currant extract, sweet cherry, raspberry, elderberry, blackberry, aronia, black soybean hull extract, and blue corn. This powder has an ORAC value in excess of 3,000 units per one gram. Therefore, at the 135 mg level that this material is found in six capsules of Ultimate Protector it provides a minimum of 405 ORAC units. AnthoComplete™is standardized to contain a minimum of 10% anthocyanins, 25% polyphenols, and 15% phenolic acids. Anthocyanins are not all created equal. Every fruit, vegetable and legume provides its own set of unique anthocyanins that reside in the body for different lengths of time and in different locations, providing a range of benefits. AnthoComplete™ has been designed to provide the necessary range of anthocyanins. Published research associates anthocyanins with healthy aging, inflammation management, improved blood sugar metabolism, and cardiovascular disease management. A patented, freeze-dried, non-GMO, and antioxidant-rich product derived from the whole fruit of the coffee plant, Coffea arabica. This product is exceptionally rich in the antioxidants called phenolic acids. This powder has an ORAC value in excess of 6,000 units per 1 gram. Therefore at the 135 mg level that this material is found in six capsules of Ultimate Protector it provides a minimum of 810 ORAC units. CoffeeBerry® Forte is standardized to contain a minimum of 85% phenolic acids. The antioxidants in CoffeeBerry® products are from polyphenols or phenolic acids, natural plant antioxidants abundant in the whole fruit of the coffee plant. Chlorogenic acids are healthy polyphenols found abundantly in CoffeeBerry® Forte. Known as a potent antioxidant, studies have shown that chlorogenic acid can help improve glucose tolerance and support glucose management. Research has also discovered that Chlorogenic acid can help support heart health by slowing the oxidation of low-density lipoproteins. Quinic acid is another common phenolic acid found in coffee. Studies show that quinic acid can help manage the downstream consequences of oxidative stress in the body. Ferulic acid is a powerful, highly available antioxidant found in coffee. It is especially effective in neutralizing free radicals known as ‘superoxides,’ ‘hydroxl radicals,’ and ‘nitric oxide.’ Ferulic acid acts synergistically with other antioxidants, thereby boosting their potency. We have included Sabinsa’s Curcumin C3 Complex® in ULTIMATE PROTECTOR. The name C3 Complex has reference to its three main chemical compounds – Curcumin, Demethoxycurcumin and Bisdemethoxycurcumin – collectively known as Curcuminoids and all derived from Turmeric. Curcumin has been shown to be an Nrf2 transcription factor activator. Studies have reported that curcumin and turmeric protect the liver against several toxicants both in vitro and in vivo. A number of reports showed the chemopreventive or curative action of turmeric and curcuminoids against cancer at various sites in the body. Curcumin is a potent scavenger of free radicals such as superoxide anion radicals, hydroxyl radicals, and nitrogen dioxide radicals. It exerts powerful antioxidant and anti-inflammatory properties. Trans-resveratrol provides antioxidant protection, boosts cellular energy, and balances the immune system. It has been proven in studies to activate the SIRT1 longevity gene and enhance cellular productivity. Several research studies have shown that trans-resveratrol activates Nrf2 transcription factor, significantly modulates biomarkers of bone metabolism, inhibits pro-inflammatory enzymes such as COX-1 and COX-2, and exhibits chemopreventive agents, anticarcinogenic properties, cardioprotective effects, neuroprotective properties, and caloric restrictive behavior. Trans-resveratrol has shown the ability to increase the number of mitochondria thereby increasing total daily energy. Studies have shown that trans-resveratrol promotes an increase in mitochondrial function. Increased mitochondrial function translates into an increase in energy availability, improved aerobic capacity, and enhanced sensorimotor function. Trans-resveratrol has an ORAC value of 31,000 units per gram. Therefore, at the 90 mg level that this material is found in six capsules of Ultimate Protector it provides 2,790 ORAC units. This nutritious non-GMO material is a powder exhibiting extremely high-ORAC value. The material is derived from freeze-dried Grape Seed, Wild Blueberry, Wild Bilberry, Cranberry, Tart Cherry, Prune, Raspberry Seed, Strawberry, Resveratrol, and Quercetin. In fact, this powder has an ORAC value in excess of 12,000 units per gram. Therefore at the 90 mg level that this material is found in six capsules of Ultimate Protector it provides a minimum of 1,080 ORAC units. VitaBerry® Plus is standardized to contain a minimum of 30% polyphenols and 18% proanthocyanidins. VitaVeggie® is the finest high ORAC source of 100% non-GMO vegetable antioxidants, concentrated extracts and whole-vegetable powders. More potent than fresh vegetables, just one gram of VitaVeggie® provides 5,000 ORAC units. Therefore, at the 90 mg level that this material is found in six capsules of Ultimate Protector, it provides a minimum of 450 ORAC units. This blend packs a double wallop of nutrition by providing quality, high-ORAC antioxidants from vegetable concentrates plus a liberal helping of fully intact whole vegetable phytochemicals from concentrated freeze-dried vegetable powders. VitaVeggie® is standardized to contain a minimum of 1,000 ppm sulforaphane and 2,000 ppm glucosinolates. Anthocyanins, lycopene, lutein, chlorogenic acid, beta-carotene, ellagic acid, quercetin and quinic acid are all found in VitaVeggie®. Bioperine® is a black pepper extract that has been shown to enhance the absorption of nutrients by 30–60 percent and makes all of the nutrients in this product more effective. Ultimate Protector™ will be most effective when used in conjunction with other foundational nutritional supplements that support the body’s metabolism, including Multi Two or Mighty Multi-Vite!™ (therapeutic multivitamin formulas), Omega Plus (essential fatty acids with Vitamin E), PRO-C™ (antioxidant formula), and one of our high-RNA Rejuvenate!™ superfoods. Other ingredients: vegetarian capsule (veggie cap), microcrystalline cellulose, silica, magnesium trisilicate. DIRECTIONS: As a dietary supplement take two capsules three times daily with food or as directed by a health care professional. ULTIMATE PROTECTOR Does Not Contain: wheat, rye, oats, barley, gluten, egg, dairy, yeast, sugar, shellfish, GMOs, wax, preservatives, colorings, or artificial flavorings. †VitaBerry® Plus, VitaVeggie®, and CoffeeBerry® Forte are registered trademarks of VDF Futureceuticals, Inc.
† CoffeeBerry® Coffee Fruit products and processes are covered by pending US and foreign applications, and one or more of the following patents: US 6,572,915, US 7,754,263, US 7,807,205, and US 7,815,959. ††† AnthoComplete™ is a trademark of VDF Futureceuticals, Inc.
†††† Bioperine® is a registered trademark of Sabinsa Corporation.